CONFUCIUS once said "where there's a will there's a way, and where's there's no will there's two siblings fighting over a 3D television''. Although I'm not planning on dropping off the perch anytime soon, and lord knows hubby's not going to the great garage in the sky until he's finished the list of jobs I've given him (which means he won't be checking out til 2070), I thought it might be wise to make a will. We don't own a 3D television (much to my children's disgust) but that doesn't stop them fighting over who'll get it. Their reasoning being we will eventually "see the light, get real and get a 3D like everyone else in the universe" before we either check into the nursing home or check out completely. As sitting at the kitchen table facing my own mortality and trying to write a will wasn't traumatic enough, I also had to deal with two kids squabbling over a television that didn't exist. I needed a diversion. "Right, who wants me to leave them something special - a real treasure - something that will increase in value?" I asked. "Oh me, me." My youngest squealed and shot her hand up in the air. "No, leave it to me, I want it," my eldest snapped back "I'm the oldest so I should get all the good stuff". Well this was a dilemma. Two children and only one copy of The Australian Women's Weekly Charles and Diana souvenir wedding edition. What's a mother to do? I know, one can have the Charles and Diana edition and one can have the Charles and Camilla edition - problem solved. Now it was on to the rest of the family heirlooms. My daughter managed to contain her excitement when I bequeathed her my precious half-empty duty-free bottle of French perfume and my eldest moved me to tears with his reaction over my old Bon Jovi albums. Once I'd filled out all the "who gets what'' columns I reached a part of the will I hadn't counted on. In the event that hubby and I should expire at the same time (a bad batch of prawns maybe?) I had to nominate someone to look after the kids. Tricky. I left several messages on my sister's answering machine but surprisingly, a week later; she still hadn't returned my calls. Okay, so who else would like to live the dream and take on my kids? The list of people who could endure such an undertaking was pitifully small. The neighbours were off the list - for obvious reasons. The kids' school teachers already spend more time with the little darlings than I do so I couldn't see them putting their hands up. My son's soccer coach could've been a contender but after last Saturday's little altercation about a disputed own goal, I don't think he'll warm to the idea. Just as I was beginning to think I'd have to leave my children in the hands of the Salvation Army (an organisation known for its tolerance and patience - making them highly qualified for the task), my sister rang back. "Hey sis there's something I wanted to ask you, a little thing really...teeny...the smallest of favours..."
After I explained what I wanted the line went deathly quiet. "Are you still there sis?" I asked trying to keep the desperation out of my voice. Silence. "Hello? Anyone there? Would it help if I threw in a 3D TV?" 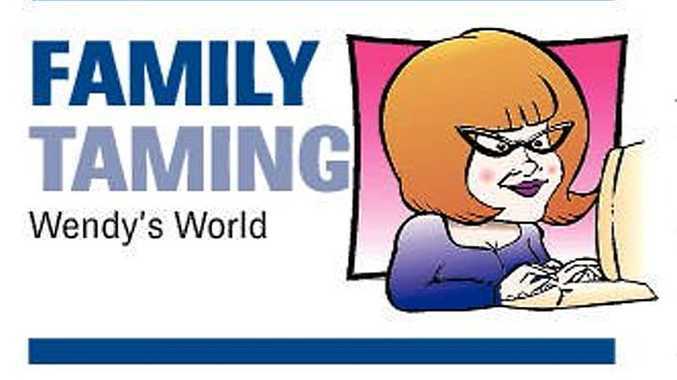 Family Taming is a weekly humour column.